That F'ing Monkey: Sharktopus won’t be kept at bay! I admit it; I have strange taste in movies. I’d rather sit and watch a Santo movie the most the things at the theaters right now. I like the old Elvis movies although 90% of them barely had any plot besides rebellious race car driver hits on hot girl. But today is a special day. Tonight at 9 is the SyFy (God I hate that name) Channel debut of Sharktopus!! That’s right; I love a low budget monster movie. Give me a Gatoroid or Megapython over another Saw clone any day of the week. After all the hype died around Snakes on a Plane, I still loved it. I own it on DVD. Monsters are fantastic and a giant shark crossed with an octopus is just so outrageous it must be seen. But there is even more, check it out after the jump. 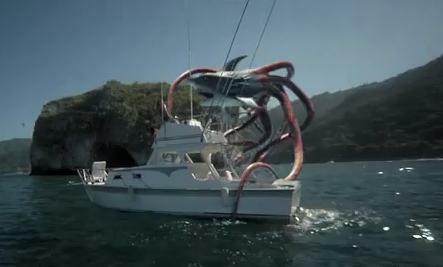 So obviously Sharktopus is a must see. Not only can it grab you with tentacles, it can use them to walk. The shot where it is climbing on the boat is one of the most absurd things I’ve seen in awhile and I love every minute of it. My DVR is already set and the fridge is already stocked with snacks. But, I’m not just excited for the great/bad movie. For months now I’ve been listening to the Cheetah Whores theme song for the movie. It is so fun I find myself singing it at odd times and just smiling away. If you don’t know what I’m talking about, check out the attached Youtube video. The song is available on ITunes for a dollar!! That my friend is a dollar well spent.